The hills have been successful in holding up the century-old traditions and cultures that have prospered the lives of the people in Incredible India. India is dotted with the awe-inspiring hills all over the country starting right up from Jammu and Kashmir to Tamil Nadu, encapsulating over 20 mountain ranges. It is a retreat in Himachal Pradesh, well known for its bewitching beauty and numerous adrenaline pumping activities. From Heli Skiing to the Temples, it has a varied diversity of everything. Manali is also renowned as the “Prime Honeymoon destination”, of India. Last but not the least, it the starting point of the most fascinating and enthralling highways in India – The Leh-Manali Highway. Kullu is known as the ‘Valley of Gods’. It has many mystical stories attached to its existence. Kullu and Manali are two twin hill stations that are flooded by the tourists throughout the year. Kullu is adorned by many beautiful scrapped temples and festivals. The grandeur and the vicinity of the Himalayas over-awe every single person who has ever visited this magnificent place. Mussoorie perched in Uttarakhand, is famed as the “Queen of Hills”. It is an extremely beautiful hill station to explore. While glaring over Dehradun, Mussoorie provides the “déjà-vu” missing out in one’s life. An evening walk on the Mall Road is enough to entangle you to get “relocated to Mussoorie” and cherish long-lasting memories. Flooded with many top boarding schools of India, Mussoorie is a tourist and education hub of Uttarakhand . The beauty of the hills has even captivated the celebrated writer like Ruskin Bond. The travel destinations near Mussoorie are Dhanaulty, Dehradun, Rishikesh and so on. Chamba valley is a picture-perfect hill station in Himachal. There are many mystical and historical past connected to the valley. It is dotted by many temples most of them dedicated to Lord Narayan “the most versed deity” in Hinduism. Chamba is a paradise for the ardent nature lovers and enthusiasts. The captivating view of the wonderful mountain ranges that surround the valley is simply irreplaceable. Embellished with many spiritual treasures, it is the one of the most pious pilgrimage points in India. Badrinath apart from being a pilgrimage place also facilitates many mountaineering and trekking expeditions. It is the vista apart from the temples that provides unmatchable silence for meditating and finding comfort. Gulmarg or “Meadow of Flowers” is nothing less than a fantasy place coming straight out of your dreams. The valley is 3km long and a kilometre wide. It is filled with beautiful blueberries, daisies and many other flowers that lighten up your mood. It also has a popular golf resort and renowned as a prime skiing destination. Along with being one of the most favourite places for tourists, Dharamshala in Himachal Pradesh is home to the holy Dalai Lama. Fringed by the lofty mountains and dotted by Deodar and Cedar forests, this beautiful hill station in India is amongst the most popular hill stations in the country. Dharamshala is situated at an altitude of about 1487m in the Kangra Valley of Himachal Pradesh. The city is divided into two parts namely, Dharamshala and Mcleodganj and is separated by a village called Ganchen Kyishong. The hill station has managed to attract the attention of many tourists due to its tranquil environ and scenic beauty. A large number of travellers throng here especially in the summer. However, many tourists like to visit in winter here to see the snowfall. Once a summer retreat of the British, Dalhousie today is another attraction for tourists all over the country. 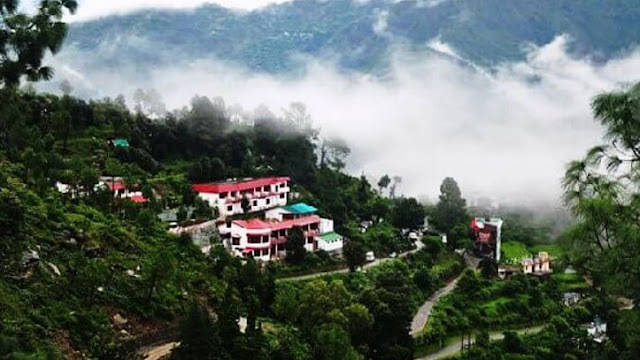 Named after British General Lord Dalhousie, this hill station in Himachal Pradesh is situated across 5 hills namely, Kathalagh, Potreyn, Terah, Bakrota and Bhangora. Situated at an altitude of 2700m, Dalhousie is a beautiful hill station that offers a panoramic view of Dhauladhar mountain range. The town is the reflection of rich Hindu culture as it is dotted with several temples and preserves the unique art and handicraft dating back to the mid 6th century AD. 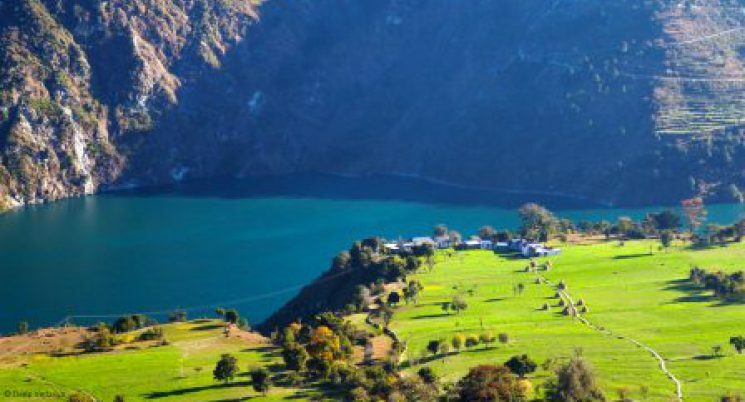 This beautiful and quiet town of Garhwal region of Uttarakhand is a perfect place to spend a vacation. Lansdowne is a destination where one can relax and enjoy the beauty of nature. Dotted with pine tree forest, Lansdowne is also the training centre for Garhwal regiment. Situated at and altitude of 1700m, this beautiful town is an ideal weekend getaway from Delhi and is also a perfect place for honeymooners. If there was one word to describe Auli, it would be gorgeous. This hill station in the lap of Uttarakhand is one of the most beautiful places to spend a holiday at. Auli is a perfect getaway in summer and winter in India as the place is known for its magnificent transformations in both seasons. 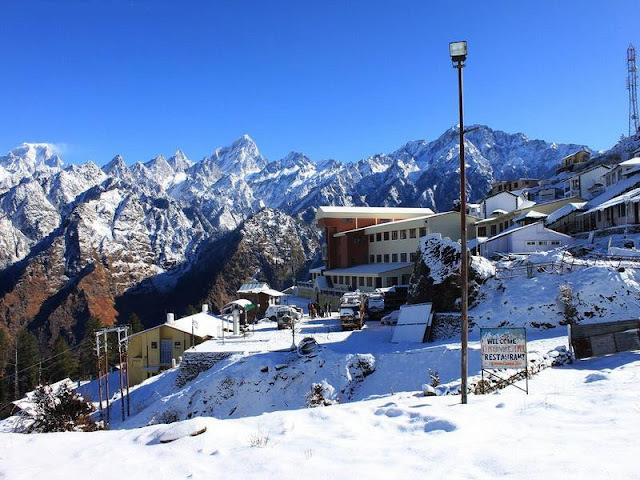 Situated at an elevation of about 2500m, Auli becomes a meadow in the summer, whereas when the snow covers it in the winter season, Auli becomes the place for winter-sport enthusiasts. It is a budding skiing destination in India and is believed to be the best when it comes to its gradient slopes. Along with adventure, the air of Auli is replete with spirituality. According to legends from Hindu mythology, Auli is believed to be the land where Lord Hanuman rested while he was finding Sanjivini Booti. Also the view of magnificent peaks like Nanda Devi and Neelkanth adds to the spiritual feel of the town. Darjeeling is also known as the dreamland of the east. Its natural beauty is enough to lure a tourist and keep him captivated all his or her life. The hill station has many exotic waterfalls, hills blossoming with flowers of every shade, and the tea gardens. The Darjeeling Tea is one of the most popular teas in the world. Kalimpong is a live example of Colonial Architecture in India. The place is replete with many monasteries and churches. It has a very peaceful and calm atmosphere, where the hustle and bustle is only limited to the local “bazars” (market). Kalimpong is renowned for its beautiful orchids and nurseries that produce flowering plants. Tawang lies in the state of Arunanchal Pradesh. It has India’s biggest Tibetan Monastery, and is a holy place for the Buddhism Pilgrimage. It is filled with numerous monasteries, nunneries, waterfalls, hot water springs and pristine lakes. Jeweled with tea estates and orange orchards, Mirik is one of the mesmerizing hill stations in West Bengal. It is a place of remarkable natural beauty and the grandeur. The reflection of Kanchanjunga Peak in the crystal-clear lakes will certainly captivate your attention. It is one of the hill stations in Maharashtra that has attracted many tourists. It is very well connected to the cities of Pune and Mumbai. There are many beautiful caves, mountains and waterfalls that when mixed with the greenery of the hill station is one vista that anyone cannot afford to miss. It is the twin hill station to Khandala. It is famous worldwide for the sweet “chikkis” that are made here. It has many caves, lakes and waterfalls. Karla caves are the must visit caves as they have connections to the Buddhism dating back to the 9th Century. Mahabelashwar is the perfect tourist destination in the state of Maharashtra. It is a most visited hill station of the state. There are umpteen numbers of lakes offering an opportunity to the visitors to try their hand in boating and fishing. It is Asia’s only automobile free hill station, providing the cleanest and freshest air and atmosphere to dwell in. The most mesmerizing part of the trip is the toy train ride from Neral to Matheran that covers the entire topography of the hill station. Panchgani is the most popular hill station of Maharashtra. It is surrounded by the 5 hills from which Panchgani has derived its name. It is a marvellous spectacle of old British and Parsi homes. The prime landscape of Panchgani is the sight of the river Krishna from the Table Land a famous flat mountain range. Apart from being the only hill station in Rajasthan, it is also the summer capital of the state. Mount Abu is renowned worldwide for the Dilwara Jain Temples. It offers many breathtaking sunsets points, from where you could cement the bond of love with your loved ones. Being close to Gujarat, it offers a good variety of Rajasthani and Gujarati handlooms, textiles, artifacts and the list goes on. Panhala though being the smallest city in Maharashtra holds a very prominent place in the history of the state. It is the place to visit if you want to study the history or the culture of the great Marathas in detail. The pollution-free atmosphere of Panhala offers a very pleasant and cool climate that makes your stay very calm and peaceful. Apart from being the only hill station in Gujarat, it definitely is its “Aankhon Ka Taara”. It is the one place you should visit, if you want to enjoy the monsoons. The place is full of lush-green forests, enchanting waterfalls etc. The picturesque landscape of Saptura leaves everyone spellbound. Munnar, located in Kerala, is one place known for its well-preserved natural beauty of the virgin forests. The environment and climate of Munnar are very salubrious that compels you to just chill and relax. There are waterfalls, coffee gardens and scenic valleys where you can stroll and have the ultimate time of your life. Aruku lies in Vishakhapatnam, Andhra Pradesh. The magic of the valley could be felt right from the moment when you take the road to Aruku through the dense forests. The hill station is surrounded with the dense forests. The calm environment of this hill station will certainly help you to knock your stress. A trail to the Sangda Waterfall is said to be the one of the most beautiful trails you will ever come across in your life. Coonoor is a most charming hill station of the Nilgiri Mountain Range in Tamil Nadu. It has got it’s the name from the Kurinji Flowers that are found on the mountain slopes. The hill station is also renowned for its aromatic teas. Trekking and hiking are the two popular adventure activities that the visitors can indulge in apart from bird watching. Known as the “Kashmir of South”, what more reason one requires for visiting Coorg. The hill station is located in Karnataka. It is famous around the world for the variety of coffee and tea plantations. The landscape of the hill station is very mesmerizing with pleasant climate throughout the year. Devikulam is located in Kerala, just 16km (approx) form Munnar. It is mostly visited by the tourists to enjoy the picturesque landscapes and the mineral water springs. It has many legends associated with Devikulam Lake, which gives the hill station its name. Idukki is one hill station of Kerala known for its exotic flora and fauna. It has several well protected sanctuaries. It is renowned worldwide for the Periyar Tiger Reserve that is an abode of many animals. Apart from the sanctuaries, the place is very peaceful and quite, offering tourists a unique relaxing experience. Kodaikanal is located in the state of Tamil Nadu and is often called “Kodai”. It is well-known for its spices, homemade chocolates, herbal teas and coffees, oils and the orchids. The landscape of Kodai has compelled people to call it the “Princess of Hills”. Ooty or Ootacamund is the capital of the Nilgiris. It is famous for the picturesque picnic spots, but; still the chief attraction remains the mile long tea gardens. Whether you are a kid or an adult, nobody skips the Nilgiri Toy Train ride. It takes you along the picturesque topography of the Nilgiris. Peermade gets its name from the famous Sufi saint Peer Mohammad who is said to have visited the hills. It is known throughout the world for its marvelous medical treatments. The scenic vista is over-awed by the fragrance of Cardamom that trails throughout the hills. Nandi Hills known as the sunrise hills of Karnataka, offers the chance to see the memorable sunrise one can ever witness. The hill station is blessed with pleasant climate throughout the year. The monsoons are the most spectacular time of year in Nandi, as the hills are all covered up by the mists, giving it a mystical sense. Horsley Hills is one of the most visited tourist destinations in Andhra Pradesh. They have a very picturesque and eye soothing landscape. It is one hill station that vouches for the relaxation it provides to the tourists.